So, this blog is going to turn into a notebook of funny things the kids say. But right now, Chiara is the only one speaking, although Luke claims Jemma can say Oma and has on several occasions now, mostly when she is wailing for me. Eventually Jemma’s funny moments will be recorded here but right now, it’s Chiara, all the time. So, Chiara and Jemma will be raised on a macrobiotic diet, which is pretty much like being vegan (no meats, no dairy, no eggs) except for occasional seafood, and with the additional restriction of avoiding cane sugar. This is basically the diet Luke was raised on. I asked Chiara about it that day, and she said she ate turkey. She explained that she told her teacher she was vegetarian so they didn’t serve her the turkey. But then she said one of her classmates asked, “What is vegetarian?” in a tone that sounded suspicious and wary, or at least that’s what it sounded like in Chiara’s telling of her story. And then the same girl asked her why she didn’t eat the turkey and so, Chiara ate it. Luke immediately got the drift and wanted to make sure Chiara understood he wasn’t upset. So he began to gently probe. “No, I’m vegetarian,” Chiara said. Today, we were walking by a panhandler and as we always do with panhandlers whether I have money for them or not, I looked her in the eye and said hello, and since I wasn’t stopping to give her money I also said sorry I couldn’t offer her anything this time. I’m supposed to write these things down…. Everyone who’s been a parent longer than I have has told me I have to write down the hilarious things Chiara says. That she’s going to ask about them when she grows up. I’ve already forgotten so many things that I have meant to write down! But this week there were doozies! So there you have it! Posted on the web for posterity. 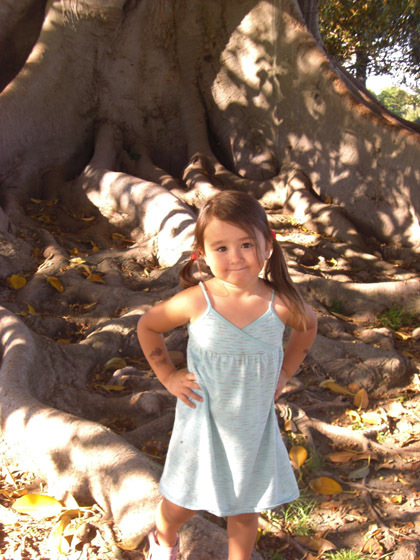 This is the munchkin last September on the roots of what I believe the groundskeeper called a kind ofÂ fig tree at a mission in Long Beach, California.